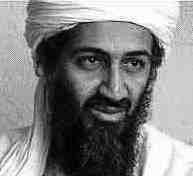 No one denies that Osama bin Laden is a crazy fanatic, the type of person this world would be much better off without. However, it is important to understand the reasons he and other terrorists have for hating the US and perpretating their terrorism. Obviously Osama's fanatic interpretation of Islam is a major factor, but there are many others which cause him to focus this hate on the US. While we cannot change the fact that the world will always have fanatics, there are some things we should be able to change which would help prevent them focusing their zeal on the US. Of course, in explaining the causes of his hate against the US I am not attempting to justify Osama bin Laden's actions in any way, rather to provide insight into why he picks the US as the target of his religious fervor. In my opinion the best way to avoid a repeat of the tragedy is to eliminate the causes, rather than exacerbate them through war. It incenses Osama bin Laden that non-believers are stationed in the birthplace of Islam. The troops were put there in the first Gulf War, due to Saudi Arabian fears that Iraq would attack. These fears were based on reports leaked by the Pentagon estimating that up to 250,000 Iraqi troops and 1,500 tanks stood on the border to Saudi Arabia in preparation for an invasion. Soviet satellite photos however show no such build-up, Iraq denies it, and the US government has refused to release its alleged evidence for such a build-up. Osama connects Israel to the US due to the US's extensive support of Israel. Part of this is the US's vetoing of 30 UN resolutions passed against Israel's occupation of Palestine. In addition to the UN resolutions vetoed by the US, Israel stands in violation of around 50 UN resolutions over a period of 30 years (the link references 65 resolutions). Israel is also the world's largest benefactor of US military aid, to the tune of $2-3 billion per year. The US has also provided Israel with what Bush would term 'Weapons of Mass Destruction' - Israel has hundreds of nukes (these it has obtained mainly through assistance from France) and has also created biological and chemical weapons with US help, which it has been accused of using on Palestinian civilians. UNICEF estimates the sanctions have caused 500,000 Iraqi children under 5 to die in the eight year period from 1991 to 1998. The UN estimates 1 million Iraqis, mostly children, had died under the sanctions in this period. The Iraqi	health ministry claims 1.5 million people. Halliday (who started the oil-for-food programme in Iraq), and Von Sponeck (his successor) - both of whom resigned their long UN careers after calling the embargo "genocide" - write: "The most recent report of the UN secretary general, in October 2001, says that the US and UK governments' blocking of $4bn of humanitarian supplies is by far the greatest constraint on the implementation of the oil-for-food programme. The report says that, in contrast, the Iraqi government's distribution of humanitarian supplies is fully satisfactory ... The death of some 5-6,000 children a month is mostly due to contaminated water, lack of medicines and malnutrition. The US and UK governments' delayed clearance of equipment and materials is responsible for this tragedy, not Baghdad." i.e. the US+UK are responsible for a tragedy greater than Sept 11 occurring every week in Iraq. Bush has termed the war on terrorism as a 'crusade'. Bush's terming of Iran, Iraq and North Korea as an 'axis of evil', and his current war against Iraq, only further serve to confirm the idea that this is a clash between Islam and Christianity. Although Bush is a little more diplomatic, Bush's spiritual advisor terms Islam an 'evil' religion. Recent comments by a general charged with finding Osama also don't help. The general said the US has been battling Satan during the war with Osama bin Laden and Saddam Hussein, that he had nothing to fear from Muslims because their god was an idol, and that the main reason terrorists attack the US is 'because we're a Christian nation'. This point is really an illustration of what an insane fanatic Osama bin Laden is. The fault of the UN and the world's superpowers (US, France, Britain etc) was not in finally granting East Timor independence in 1999, but their support of Indonesia's occupation of and genocide in East Timor for the previous 24 years. Sheik Omar Abdul-Rahman (later convicted to life imprisonment for his central role in the bombing) is enlisted by the CIA as a "valuable asset" in covert operations involving the Afghan mujahideen, during which time he befriends Osama bin Laden. Ramzi Yousef, the eventual mastermind of the bombing, is thought to have gained his explosives expertise on the Afghanistan-Pakistan border in al Qaeda training camps during this period, and is also known to have close ties to Osama bin Laden. Emad Salem, another former Mujaheddin fighter, enters the US. Sheik Omar Abdul-Rahman is granted a one-year visa from a CIA agent posing as an official at the US Consulate in Khartoum, Sudan. He arrives in New York in July 1990 despite being on the US State Department's "watch list" of non-Americans believed to be involved in terrorism since 1987. Sheik Omar's visa is revoked, and the State Department advises the Immigration and Naturalization Service to be on the lookout for him. So attentive is the INS to this advisory that it grants Sheik Omar a green card just five months later. The FBI recruits Emad Salem as an informant. Through him, the FBI learns of the bombing plot. A rift develops between Salem and the FBI, and it is agreed that Salem's undercover investigation should be terminated. A bomb is set off in the World Trade Center, killing six people, wounding over a thousand and inflicting $500 million in damage. Within 48 hours of the bombing, the FBI requests Salem to help them solve the case, who quickly points the finger at the defendants. The FBI puts Emad Salem back on the payroll, paying him over $1 million to continue as an informant. Emad Salem then recruits another bunch of Muslims for another bombing, and then turns them all in in a classic case of entrapment (prosecutors would concede that none of the defendants had the technical knowledge required and that the chemicals they were allegedly mixing would never have exploded). The relevance of this is that it is alleged that the entire conspiracy (in the WTC bombing) was also the product of Salem, who needed to bust something big to earn his $1 million reward from the FBI. The New York Times reports that the FBI knew in advance that terrorists were plotting to build a bomb and 'blow up the World Trade Center' and 'planned to thwart the plotters by secretly substituting harmless powder for the explosives...'. Also revealed is how Salem secretly recorded his conversations with FBI agents and, as the transcripts show, tried to complain to FBI Headquarters in Washington about the bureau's failure to stop the bombing but was dissuaded by an agent identified as John Anticev. Defense attorney, William Kunstler, had seen some of the transcripts and described them as "filled with all sorts of Government misconduct." Aside from the above-mentioned links of many of the conspirators to Osama bin Laden, a message left by one of the attackers found following the attacks stated 'Next time, it will be very precise.' (the terrorists had aimed to topple the towers, and could have succeeded if the bomb had not been placed in the wrong place). The overall mastermind of the 9/11 attacks, Khalid Shaikh Mohammed, is a close relative of Ramzi Yousef, thought to be his uncle. Contact begins between Osama Bin Laden and the CIA, as Osama goes to Afghanistan to fight the Soviets, with support from Pakistan's intelligence service (ISI), with the ISI's operation being funded by the CIA. General Mahmoud Ahmad, chief of the US trained Pakistan intelligence service, arranges for $100,000 to be given to Mohammed Atta (alleged hijacker on 11 Sept). General Mahmoud Ahmad arrives in the USA on 4 September and, over the days that follow, has regular consultations with his counterparts at the CIA and Pentagon. He spends the morning of September 11th in Washington, having breakfast with the chairs of the US Senate and House intelligence committees. According to the French media, Osama Bin Laden was treated at this time for a kidney problem at the American Hospital in Dubai, and while in hospital, he allegedly received a visit from a CIA official. The CIA denies the meeting took place. German central bank research shows that 'activities on international financial markets must have been planned and executed with the necessary knowledge', noting that trading in so-called put options, which rise in value when stock prices fall, surged as much as 285 times the previous average volume in American Airlines and United Airlines during the days before Sept. 11. The subject was then deemed of little importance by the media and thus there was no subsequent discussion about the incident. However, it would appear that either the first story was a lie made in an attempt to protect the president's image, or the retraction of the story was a lie perhaps to avoid explaining where the information came from. Mohammed Atta's passport is conveniently found (in perfect shape) near the wreckage of the WTC, despite the	four black boxes (designed to survive such impacts) from the planes being allegedly destroyed. FBI Director Robert Mueller acknowledges that the identity of several of the suicide hijackers is in doubt. Waleed Alshehri confirms he is alive and well, yet is indeed the same Waleed Al Shehri to whom the FBI has been referring (he attended flight training school at Dayton Beach in the US). Abdul aziz Al Omari is also alive and well, but had his passport stolen in 1995. Saeed Alghamdi (with matching name, place, date of birth and occupation to the alleged hijacker) is also found to be still alive. Salem Al-Hazmi is also still alive, but had his passport stolen three years before the attacks. The photo published by the FBI is of the living Salem Al-Hazmi. Ahmed Al-Nami is also still alive and has never lost his passport. The FBI claims to have resolved questions about the identities of the 19 hijackers involved in the Sept. 11 attacks, and to know for certain the 19 who are responsible. However to this day no revised list of the hijackers identities has been made public. Bush and Cheney do their best to block an inquiry into Sept 11 from going ahead. Bush names Thomas Kean as the new chairman of the 9/11 Commission. Kean has business ties to Osama's brother-in-law, who is suspected to have funnelled millions of dollars to the Al Qaeda network and is named as a defendant in a lawsuit filed by families of Sept 11 victims. The Commission also has other problems - including receiving only $3 million in funding (compare this with the millions spent on the Lewinsky scandal, or the shuttle tragedy inquiry, which is estimated to cost $40 million). Two hours before the attacks, employees of the instant-messaging firm Odigo in Israel receive text messages warning of an attack on the World Trade Centre. Shortly following the attacks, the media repeatedly shows pictures of Palestinians apparently celebrating the attacks, switching repeatedly between these pictures and the pictures of the Twin Towers. Only later is it revealed that the Palestinian celebrations were staged by Israeli defence forces, with the celebrations having nothing to do with the Twin Towers attacks. Following the attacks, police detain five men in a van, who claim to be Israeli tourists, found carrying maps linking them to the blasts. They are stopped due to an FBI alert to be on the lookout for their vehicle. It reads 'Three individuals with van were seen celebrating after initial impact and subsequent explosion. FBI Newark Field Office requests that, if the van is located, hold for prints and detain individuals.' Sources also say that bomb-sniffing dogs reacted as if they had detected explosives, although officers were unable to find anything. The New York Times reports that, contrary to earlier reports, 'There were, in fact, only three Israelis who had been confirmed as dead: two on the planes and another who had been visiting the towers on business and who was identified and buried.' Given the around 4,500 death toll, this is surely a statistical impossibility excluding foreknowledge of the attacks by Israelis. While that would be a huge story in itself, the connections to September 11th are the most shocking. It mentions that the Mossad sent representatives to the US to warn, just before 9/11, that a major terrorist attack was imminent. However, the warning was nonspecific and general, and investigators believe that it may have had something to do with the desire to protect what are called sources and methods in the intelligence community. The suspicion being, perhaps those sources and methods were taking place right here in the United States. The FOX News article disappears within days from the web without a trace, and is not picked up by any other news outlets. The Jewish reaction may have had something to do with this. A DEA report is leaked, revealing more information regarding the Israeli spying operation, most notably that some of the Israeli operatives were only a few blocks and a few hundred feet from where the Sept. 11 hijacking leader, Mohammad Atta, was staying at the time.